The second Karmapa, Karma Pakshi, was a powerful master. Born in Kyil-le Tsakto in eastern Tibet to a noble family of yogins, the young boy was named Chözin by Khache Panchen. He was a child prodigy who already had a broad understanding of Buddhist philosophy and practice before the age of ten. On his way to Central Tibet for further education, he encountered Pomdrakpa, who had received the full Kagyu transmission from Drogön Rechen, the first Karmapa’s spiritual heir. 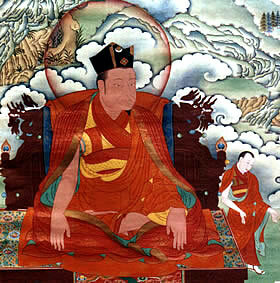 Pomdrakpa realized, through certain very clear visions, that the child he met was the reincarnation of Düsum Khyenpa. Pomdrakpa conferred on the young Karma Pakshi all the teachings through traditional empowerments and formally passed on the lineage in full. Ever since this time, each young Karmapa, despite his pre-existing knowledge and accomplishment of the teachings, formally receives all the transmissions of the teachings from a lineage holder. The second Karmapa spent much of the first half of his life in meditation retreat. He also visited and restored the monasteries established by the first Karmapa. He is famous for having introduced the melodious chanting of the Om Mani Padme Hung, the mantra of compassion, to the Tibetan people. At the age of 47 (1252), he set out on a three-year journey, at the invitation of Kublai, grandson of Ghengis Khan. Chinese and Tibetan histories, record that the Karmapa was said to have performed many spectacular miracles at the court. He also played an important role as a peacemaker. However, the Karmapa declined to stay permanently in the court, which caused Kublai Khan’s displeasure. After Möngke’s death, Kublai became the Khan and ruled a vast empire. However, harboring resentment against the Karmapa for his refusal to stay in the court of Kublai and due to his perception that the Karmapa had paid more attention to the Munga Kahn many years before, Kublai Kahn ordered the apprehension of the Second Karmapa. The Karmapa thwarted each attempt to capture, or even kill him, despite the overwhelming forces sent against him. As the Karmapa continually responded to force with compassion, Kublai Khan eventually had a change of heart. As time passed, gradually Kublai Khan came to regret his actions against the Karmapa, and eventually approached him, confessing his misdeeds, and requesting Karma Pakshi to teach him. In fulfillment of a long-standing vision, His Holiness returned to Tibet and directed the building of a Buddha statue at Tsurphu, well over fifty feet in height. The finished statue was slightly tilted. In one of the most well-known miraculous stories of the Karmapas, Karma Pakshi was said to have straightened the statue by assuming the same tilted posture as the statue, and straightening himself. The statue simultaneously righted itself. The histories record that the Second Karmapa composed over one hundred volumes of texts, which once were enshrined at the monastic library of Tshurphu monastery in Central Tibet. Before passing away into parinirvana, Karma Pakshi told details concerning the next Karmapa’s birth to his main disciple, Orgyenpa. In 2012 the 17th Karmapa composed and directed a three-part play about the life of Karma Pakshi. You can watch the recording on YouTube. You can also see a lovely talk given about Karma Pakshi by the Karmapa before bestowing the Karma Pakshi empowerment, a very important practice in the Karma Kagyu lineage.